There are a couple of ways in which you can come to hold a provisional P2 car licence (green Ps). If you're over 25 when you pass the Q-SAFE Practical Driving Test, you will skip the red Ps and be issued a provisional P2 licence. You must hold this licence for 12 months before you are able to progress to an open licence (you won't have to take the Hazard Perception Test (HPT)). 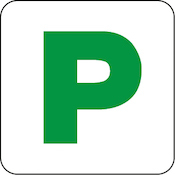 If you were under 23 when you got your provisional P1 licence (red Ps) you must pass the HPT and then hold your provisional P2 licence (green Ps) for at least 2 years to progress to an open licence. Despite the complex nature of this system, basically you've got to be on your provisional licence (whatever you get when you pass the practical driving test) for 12 months before attempting the HPT. If you pass, you will progress to either the provisional P2 or open licence depending on your age. You must also be at least 18, prove your identity, and pay the licence and test fees. When you pass the HPT, your green Ps (provisional P2 licence) is valid for up to 5 years or until you get your open licence. In addition to following the road rules like all road users should, there are specific rules associated with a provisional P2 licence licence. Disobeying these additional rules could result in heavy fines or loss of licence.